A common snapping turtle was admitted to the clinic with a left mandibular (lower jaw) fracture (see fracture repair site circled in photograph). After a few days of observation and care, it was determined that the turtle would need surgery to stabilize and repair the fracture. Once the turtle was under anesthesia, the veterinarians were able to stabilize the broken jaw by drilling holes on either side of the fracture site and inserting a wire into the holes. The wire was then securely tightened in order to prevent movement of the bone fragments, thus allowing the fracture site to heal. 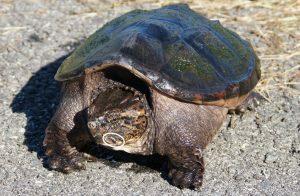 By using this method, the turtle is still able to behave as it normally would, opening and closing its mouth to eat, and even “snapping” at any perceived threats. Because reptiles take a long time to heal, the wire will stay in place until the springtime to make sure the fracture site has repaired completely. At that time, the wire will be removed by the vet staff and the turtle will be released back into the wild.